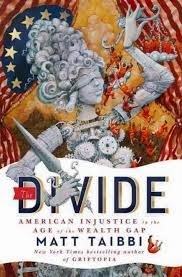 The Divide by Matt Taibbi is a thorough and well-written book that definitely deals with income inequality, but beyond this is about how in America today we have laws that are supposed to apply to all, but completely different sets of consequences for breaking them depending on income level. The book appears to have come out of, or at least is related to, Taibbi's 2011 Rolling Stone piece "Wall Street Isn't Winning – It's Cheating" and is richly packed with examples and details how white-color financial crime by the wealthy rarely leads to the arrest and prosecution of individuals, but punishment for nuisance offenses and other crimes perpetrated by the poor are often pursued zealously by the police, courts and government. Taibbi makes the point that neither the harsh nor lenient approach wrong, just that they shouldn't simultaneously exist depending on income class. In terms of why white-color crime so infrequently leads to jail time for individuals, and more often to no-admission-of-fault settlements with financial institutions, Taibbi offers a number of different reasons why. More than anything else, it seems that it comes down to prosecutors wanting easy cases to win and that financial crime can often be both complex and made out to be even more complex by legions of defense attorneys arguing technicalities and reasons for exclusion from prosecution. Additionally, the courts have frequently used the argument that to punish too severely either a guilty company or individuals within those companies could have a detrimental impact on markets and jobs, with the courts citing “industry experts” as being those arguing against criminal charges within the same industry. The examples from Taibbi are fairly brutal in the fraud committed, ranging from Barclay’s giving $112M in bonuses to nine Lehman Brothers executives while they were negotiating a $5B profit on the sale of Lehman assets to Barclay’s, to financial titans employing thug-like tactics in their attempts to destroy a company they had shorted and would profit greatly from it going under. Taibbi writes in the book of how if white-color financial crime can often be complicated to prosecute and at times difficult to pinpoint the guilty individuals to blame, the crimes of the poor can be much easier to see and prosecute, or to just accuse someone of the crimes and then make their lives difficult. It’s noted that over the past 20 years, violent crime has dropped heavily, poverty has risen, and prison populations have skyrocketed, the result of aggressive policing methods against the poor, basically spreading a huge net and seeing what sticks in it, based on the idea that the poor are probably doing something wrong anyways. From nuisance arrests for things like loitering or obstructing traffic (basically standing on a sidewalk) to the zealous pursuit of welfare frauds and illegal immigrants, it does appear to be a wide scale denigration of the poor and application of the Bill of Rights as being on a class basis rather than applied to all. Similar to how Taibbi writes that it’s not wrong to have either lenient or strict standards of justice, just wrong to have both depending on income level, he writes that it’s not that welfare fraud shouldn’t be policed and not that illegal immigrants shouldn't have consequences from being here illegally, but rather it’s a question of how we treat those that may be guilty and what rights we give to them. The assumption of guilt and zealous pursuit of the perhaps guilty poor matched up against the too-complicated-of-a-tale to find guilt with the wealthy is where the concept of The Divide comes in. Along these same lines, the point is made that people on one side of the divide in general have no idea how bad it is on the other side. Taibbi closes the book with a touch of optimism about the prosecution of financial crimes at the same time that New York City's stop-and-frisk laws are being challenged in courts, but even with that, it’s definitely a sobering and well-told story of two different ways treating people based on class.